The Bennett Creek Park pier is 125' in length along Bennetts Creek. 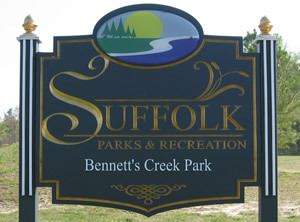 Bennetts Creek Park is 57 acres in size and offers a boat ramp, reservable shelters, playground, tennis courts and restrooms. The Elizabeth River Park fishing pier is operated by the City of Chesapeake and is is a 180' feet in length along the South Branch of the Elizabeth River. The facility offers, picnic shelters, grills, playground and restrooms. The Ocean View Fishing Pier is about 1450' in length over the waters of the Chesapeake Bay. Go 4/10ths of a mile down Cpl J M Williams Avenue from above intersection, entrance to parking area behind tennis courts will be on your right. 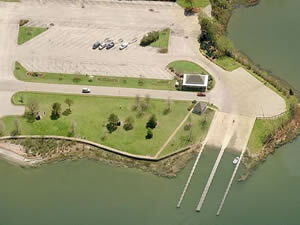 The Portsmouth City Park fishing pier is along an alcove off of the W. Branch Elizabeth River and offers; pier 200' in length with a 60' "T", picnic pavilions, playground and restrooms. Areas around Chesapeake City, Virginia Include; Benefit Bower's Hill, Buell, Camelot, Crestwood, Eva Gardens, Fentress, Gertie, Gilmerton, Grassfield, Great Bridge, Greenbrier, Hickory, Hodges Ferry, Indian River, Mount Pleasant, Northwest, Oak Grove, Oaklette, Portlock, South Norfolk, Sterns Creek and Wallaceton. Bodies of Brackish & Saltwater in Chesapeake City, Virginia Include; Baines Creek, Craney Island Creek, Deep Creek, Drum Point Creek, Eastern Branch Elizabeth River, Elizabeth River, Hoflers Creek, Hull Creek, Indian River, James River, Jones Creek, Julian Creek, Knitting Mill Creek, Lafayette River, Lilly Creek, North Landing River, Paradise Creek, Pescara Creek, Pocaty River, Scott Creek, Scuffleton Creek, Spotico Creek, Steamboat Creek, Tartts Creek, Western Branch Elizabeth River and Willoughby Bay.